n high school you may may have been told there are three states of matter – solid, liquid and gas. Plasma, the ingredient of stars, is a fourth. Once we include states that are only made by humans, however, the true number is much larger and keeps rising. The latest addition behaves in a quantum mechanical manner, even at macroscopic size, rather than following classical thermodynamic models. States of matter that behave in quantum mechanical ways have been found before. Bose-Einstein condensate is the most famous. At temperatures close to absolute zero it starts behaving like subatomic particles, manifesting the distinctive mix of wave and particle-like behaviors. Superfluids, like helium-3, also have some quantum mechanical aspects. 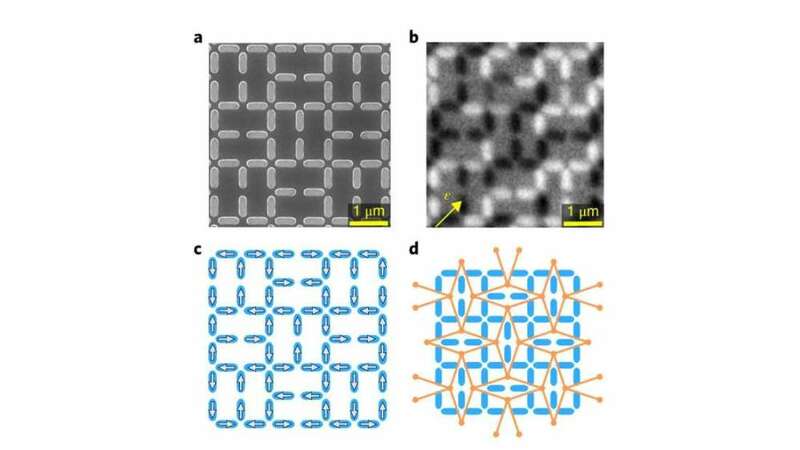 The latest addition, announced in Nature Physics, is what is called an artificial spin ice. These are made up of tiny interacting magnets that can be combined to form exotic materials that differ from any natural state of matter, or even other artificial ones. This specific spin ice, dubbed Shakti artificial spin ice, has its own quirks even compared to other members of this exotic grouping. Where states of matter are usually classified as ordered, like crystals, or disordered, like fluids, Shakti spin ice appears to be disordered, but has topological order in what looks like a case of life imitating art. “The demonstration that these topological effects can be designed into an artificial spin ice system opens the door to a wide range of possible new studies,” said Yale’s Professor Peter Schiffer, senior author of the study, in a statement. The energy of artificial spin ices can be removed a series of steps, causing the magnets to reach their low energy state. However, in Shakti artificial spin ice, energy levels stay the same. “The system gets stuck in a way that it cannot rearrange itself, even though a large-scale rearrangement would allow it to fall to a lower energy state,” Schiffer said. It is nothing new for a material to be trapped in a raised energy state, unable to get down. It’s analogous to a ball prevented from rolling off a table by a small lip, even though its lowest energy state is on the floor. However, the researchers who made Shakti spin ice were initially unable to determine what was keeping their product from reaching the low energy state. Eventually, a previously proposed theoretical system, known as the dimer cover model, was identified as matching what was being observed in the laboratory. “Our research shows for the first time that classical systems such as artificial spin ice can be designed to demonstrate topological ordered phases, which previously have been found only in quantum conditions,” said Los Alamos National Laboratory’s Dr Cristiano Nisoli who led the theoretical part of the collaboration.